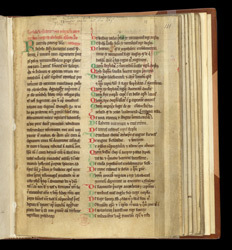 The history begins with William's letter to Abbot Ernaldus of Rievaulx, as identified by the red inscription (rubric) at the top of the 1st column. In the second column, a list gives the titles of the book's chapters, beginning with William the Conqueror. Several chapters are devoted to the reign of King Stephen.